2011 has been the year that fundamentally transformed the ITER construction site in Cadarache. The designs of two key buildings have come to life and demonstrated even to sceptics that the collective commitment and determination of the ITER parties has paid off. It’s one of the last dawns of the year and we have decided to visit the ITER platform, located at one the highest points of the site, so as to observe the scale of progress. The activity is kicking off as the workforce resumes its tasks, the site is getting noisier and busier with trucks, cranes start moving materials and the first buildings stand out in what was until a year ago a field. So how did we get here? 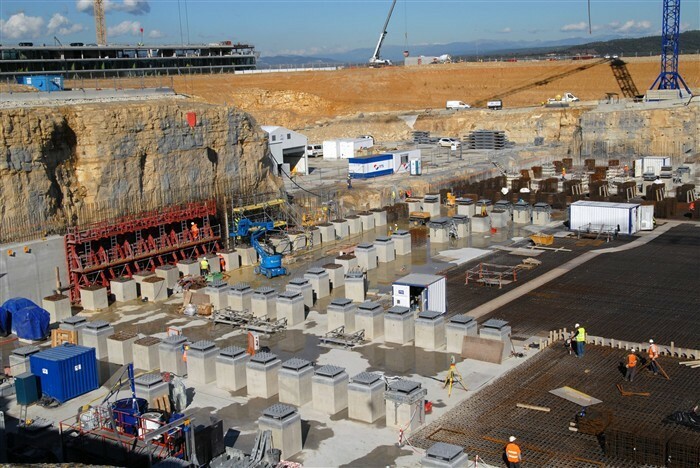 F4E, managing Europe’s contribution to ITER, is responsible for the financing and supervision of the construction of buildings, infrastructure and power supplies. A sequence of events starting with internal co-ordination for the drafting of specifications, the launch of procurement packages linked to the work on the site, awareness days with industry and SMEs, the signature of contracts, the deployment of resources on the site and steady supervision of contractors make up to the work behind the scenes. After months of intense construction work the Poloidal Field Coils (PF) building is nearly completed. Its impressive dimensions: 250 metres long, 45 metres wide and 17 metres high are vivid reminder of the size of the coils that will be assembled here for the ITER machine. The cladding, insulation and the transportation of heavy equipment like the two cranes and the spreader have reached their final destination and have been assembled. As we cross the site we arrive at the Tokamak complex, the heart of the ITER project. Only one year ago the excavation started with rock blast activities and bulldozers levelling the ground. In spring, what used to be an amorphous pit started transforming into the foundation of the Tokamak complex covered with a steel safety mesh in order to continue with the soil investigation activities and the treatment of rock joints. In summer we reached a breakthrough: the first steel reinforcement and the pouring of the first concrete. Two pumps were placed at the top of the Tokamak pit and for approximately ten hours 800m3 of concrete were poured and leveled. This exercise was to be repeated 21 times in total in order to cover the entire surface of the Tokamak pit measuring 110 metres long and 80 metres wide, the equivalent to the footprint of a football stadium. In autumn, the plinths and anti-seismic bearings started populating the basemat exceeding 250 in total accompanied by the first glimpse of the of the retaining walls foundations. The transformation of the site is only the beginning of what will follow next year. The signature of the site adaptations contract in August, is expected to deliver the necessary works on the ITER site in order to develop roads for the transport of material and equipment, extend power supply and water distribution, deliver the required amenities for a workforce of 3,000 people and streamline all protocols for safety, security and access to the site. We will continue to bring you the latest news through images, clips and updates through Twitter and YouTube next year! To watch the two annual clips documenting the PF Coils building and the Tokamak complex progress during 2011 click here.